Chocolate is made from plants, which means it contains many of the health benefits of dark vegetables as part of your anti-aging diet. These benefits are from flavonoids, which act as antioxidants. Antioxidants protect the body from aging caused by free radicals, which can cause damage that leads to heart disease. Dark chocolate contains a large number of antioxidants (nearly 8 times the number found in strawberries). Flavonoids also help relax blood pressure through the production of nitric oxide and balance certain hormones in the body. In fact, cocoa and chocolate products have been used as medicine in many cultures for centuries. 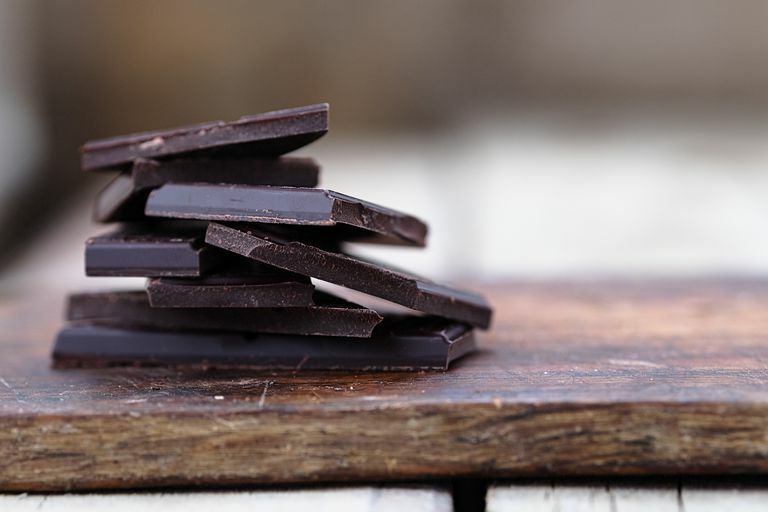 Lower blood pressure: Studies have shown that consuming a small bar of dark chocolate every day can reduce blood pressure in individuals with high blood pressure. Doesn't Chocolate Have a lot of Fat? Stearic Acid is a saturated fat but one which research is shows has a neutral effect on cholesterol. This information doesn't mean that you should eat a pound of chocolate a day. Chocolate is still a high-calorie, high-fat food. Most of the studies done used no more than 100 grams, or about 3.5 ounces, of dark chocolate a day to get the benefits. One bar of dark chocolate has around 400 calories. If you eat half a bar of chocolate a day, you must balance those 200 calories by eating less of something else. Cut out other sweets or snacks and replace them with chocolate to keep your total calories the same. Chocolate is a complex food with over 300 compounds and chemicals in each bite. To really enjoy and appreciate chocolate, take the time to taste it. Professional chocolate tasters have developed a system for tasting chocolate that includes assessing the appearance, smell, feel and taste of each piece. Dark chocolate has far more antioxidants than milk or white chocolate. These other two chocolates cannot make any health claims. Dark chocolate has 65 percent or higher cocoa content. You should look for pure dark chocolate or dark chocolate with nuts, orange peel or other flavorings. Avoid anything with caramel, nougat or other fillings. These fillings are just adding sugar and fat which erase many of the benefits you get from eating the chocolate. It may taste good but some research shows that washing your chocolate down with a glass of milk could prevent the antioxidants being absorbed or used by your body. Is Macadamia Oil Good for You?